The pericardium is a thin membrane that follows the contour of the heart and forms a sac-like structure. Most of the time, the sac is empty and the membrane serves as a lubricated surface inside which the heart can easily move. Pericardial effusion occurs when fluid collects in the sac, which ultimately leads to cardiac tamponade. During cardiac tamponade the fluid puts pressure on the heart to the point that the chambers of the heart cannot expand to fill with blood. If they cannot fill with blood, the heart cannot pump blood to the rest of the body. The most common causes of pericardial effusion include bleeding from a heart base, a right atrial tumor, or idiopathic (from unknown causes) inflammation. Other less common causes include bleeding disorders, bacterial or viral infections, heart failure, low blood protein levels or other ill-defined causes. An echocardiogram is the best way to diagnose pericardial effusion and will show buildup of fluid in the pericardial sac or indicate that the walls of the heart are moving abnormally (cardiac tamponade). Abnormal heart rhythms may be visible on an electrocardiogram (ECG). Thoracic radiographs of the chest may show a very large, round heart; however, if the fluid accumulates rapidly, the size of the heart may be normal on the radiographs, at least initially. 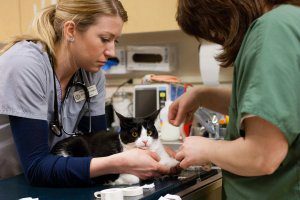 Abdominal ultrasound and blood work including a complete blood count (CBC), serum chemistry profile and urinalysis may be needed to look for signs of underlying disease processes. Your pet may exhibit weakness, lethargy, intolerance to exercise and decreased appetite. Other gastrointestinal signs such as gagging or vomiting may be present. Ascites (fluid buildup in the abdomen), episodes of collapse or difficulty breathing may also be present. 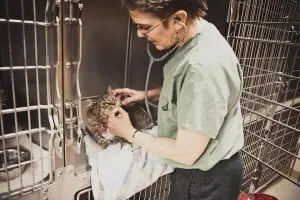 In a patient experiencing significant pericardial effusion, removing even a small amount of fluid with a needle or catheter (pericardiocentesis) relieves the pressure around the heart, and the patient usually feels much better. The benefits gained from performing pericardiocentesis usually outweigh the potential complications. This procedure is performed under local anesthesia on an outpatient basis. Pericardial effusion may re-accumulate over a period of hours to months. The course of continued treatment of pericardial effusion largely depends on the cause. For patients with idiopathic pericardial effusion, or sometimes those with pericardial effusion secondary to certain heart base tumors, surgical removal of a portion of the pericardium may be recommended. This allows the fluid that would be trapped within the pericardium to drain into the larger space of the chest cavity, and then be absorbed. In these cases, removal of a portion of the pericardium can offer a good prognosis. For patients with pericardial effusion secondary to a right atrial tumor, surgical removal of the pericardium is not recommended. For these patients, periodic pericardiocentesis can be performed as needed for as long as the patient can maintain a good quality of life at home. On average, patients with right atrial tumors have a survival time of 2-4 months following diagnosis.